Most remote teams rely on several solutions to fulfill all of their collaborations needs: email and communication, project management, database management and group meetings, just to name a few. HyperOffice offers distributed teams the benefit of all essential business tools in a single collaboration suite, as well as mobile capabilities for today’s remote workforce. Business email. Companies can set up their own branded emails (users@company.com) using the HyperOffice webmail module that includes a variety of features, such as folders, email rules, tabs, search, flags, and spam- and virus-filtering. Outlook synchronization. For those users who prefer to use Outlook, HyperOffice offers the abilities to access and manage an Outlook account on any PC, Mac, or mobile device, and all changes are automatically synched, updated, and mirrored. Push email. The push email and mobile sync capabilities of HyperOffice allow users to push and sync email, contacts, calendars and tasks with almost every major mobile device, including iPhone, BlackBerry, Android, Windows Mobile, and Nokia, and since HyperOffice is a team platform, users can use their mobiles phones to sync with a shared group calendar that updates all other team members of updates and changes. Document management. Users can store and organize documents online and are able to apply multiple levels of permissions. 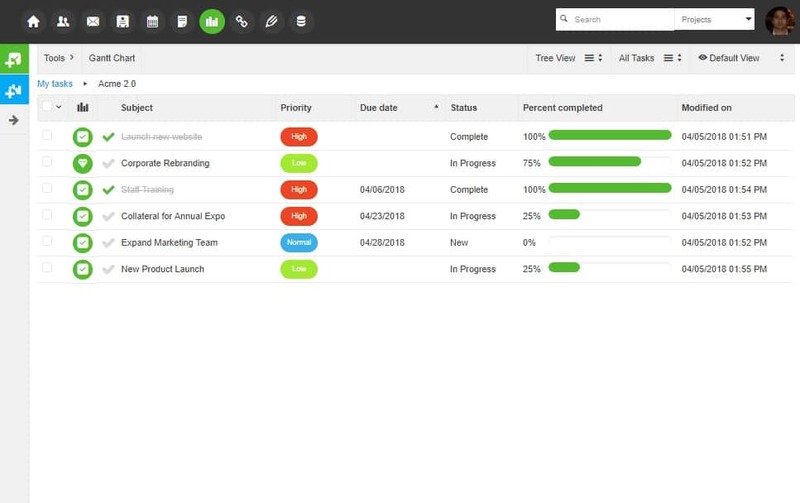 HyperOffice also includes collaboration features like versioning, comments, audit trails and change notifications. Users can also conduct full-text searches and allow other users to access, manage, and upload documents from their own desktops with easy drag-and-drop functionality. Project management. Project management is an important aspect of managing distributed teams, and with Hyperoffice’s project management module, managers and business owners are able to control multiple projects across multiple teams. Users can create projects and tasks, set timelines, and track progress, and every user gets a to-do list of assigned tasks. For more sophisticated projects, task dependencies are available, as well as interactive Gantt charts to allow users to manage tasks visually. Intranet/Extranet workspaces. HyperOffice includes a drag-and-drop intranet publisher that allows users to create customized workspaces for their groups and teams. Calendars and contacts. Shared group calendars let teams manage their schedules with such features as color coding and meeting invites, and with shared address books, users can manage and share contacts across the team. In addition to these features, HyperOffice also offers wikis, surveys, forums, notes, and reminders to help teams collaborate and share information in real time. HyperBase. HyperOffice includes HyperBase, a simple web form and online database tool that lets users create simple database applications to automate common workflows, such as lead tracking and order processing. HyperMeeting. Users also have the option of using HyperOffice’s web conferencing platform, HyperMeeting, which includes features such as shared presentations, audio conferencing, instant messaging, and file sharing. Interlinked data. Every piece of data within the HyperOffice system can be “interlinked” with any other piece of data, which allows users to create context around particular transactions or people. For example, relevant documents and email records can be attached to a calendar event for an important meeting, or documents, projects, calendar events, forum discussions, and surveys can be attached to a particular contact. 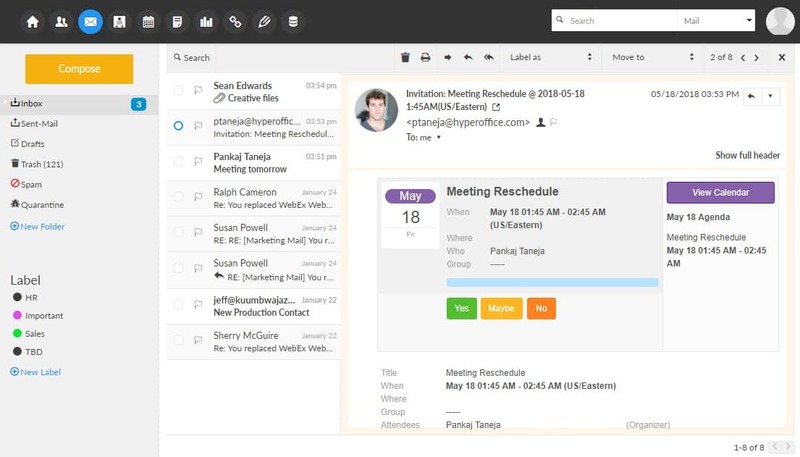 Another example is the email-to-tasks feature, where users can create a task out of an email with a single click. The best thing about HyperOffice is that it combines all collaboration tools into one solution, helping to avoid the web app patchwork quilt problem (GigaOM Pro link, sub. req.) and keeping remote teams organized and working effectively.